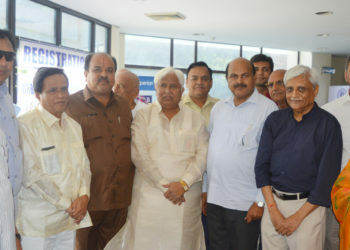 In an exercise which saw universal appeal of H K Patil and hard work of Jyotindra Mehta in full play, the Panel led by Patil-Mehta romped home comfortably at the NAFCUB elections conducted on Sunday at the NCUI headquarters in Delhi. The newly elected Board elected Jyotindra Mehta as its President and K K Sharma and Vidyadhar Anaskar as the two Vice-Presidents respectively. “We would not have the usual faces of the likes of Mukund Abhyankar or Ramesh Bung or Raghvendra Rao to see at the NAFCUB Board meetings now as each of them has been shown the door in this elections”, said a Mehta supporter with a chuckle. Another climb down has been for Jharkhand representative R.B.Sahandilya who was elected as Director but lost the post of Vice-President to K K Sharma. Anaskar, however, remains constant in his position. For the first time in the history of Nafcub, there is a designation for Chairman Emeritus which is handed over to H.K.Patil, former Minister and Veteran cooperator from Karnataka. 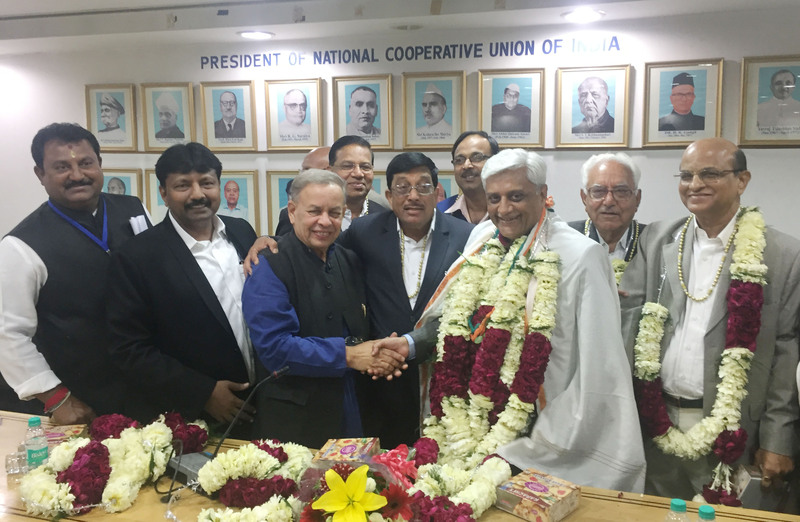 Once again, Indian Cooperative headlines “Mehta Panel races to a landslide victory” was proved correct. Many cooperators objected to the choice of word “Mehta Panel” and wanted us to write “Patil Panel” instead. But Indian Cooperative sensed what H K Patil himself sensed after consulting the elected Board members that the majority wanted Mehta to be the President. But it does not in any way mean that Patil was favored over Mehta. The Elected Board members trusted Patil’sdecision so much that when he said that he has been made Congress Campaign Committee Chief in Karnataka and won’t be able to spare time, they did not object to his opting out. It was a cooperative spirit at its best with both Patil and Mehta ready to abandon their claim for each other! It was a fantastically coordinated efforts by the winning Panel where the larger than life image of H K Patil, the veteran cooperator was put to the utmost use to get votes from across the country. And Mehta was careful enough not to leave loose ends. They convinced voters after voters well in advance about the benefits of choosing their panel. There were 389 eligible voters in the Urban Cooperative Banks Constituency but only 355 voters participated in the election. Over 85 percent polling was recorded. There were two panels in the fray which was headed by Patil-Mehta and another led by Mukund Abhyankar-Raghvendra Rao and Ramesh Bung. Both the panels had fielded 7-7 candidates in the fray. However, the panel of Mukund Abhyankar could win just one seat in women category where Arti Bisaria lost to Alka Srivastava. While Alka Srivastava got 23 votes Bisariya could bag only 11 votes. Other candidates did no better. High profile Ramesh Bung from A.P.Mahesh Cooperative Bank who was ahead till 4th round of counting lost finally. The counting was held in seven rounds. Votes garnered by Abhayankar Panel was like this: Dr M.L.Abhyankar, Group Chairman, Cosmos Cooperative Bank (128), Ramesh Kumar Bung, Chairman Emeritus, AP Mahesh Cooperative Urban Bank (157), CH. 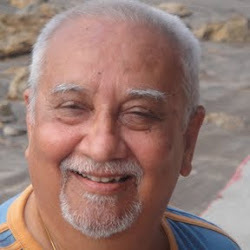 Raghvendra Rao, Visakhapatnam Cooperative Bank (144), CA. 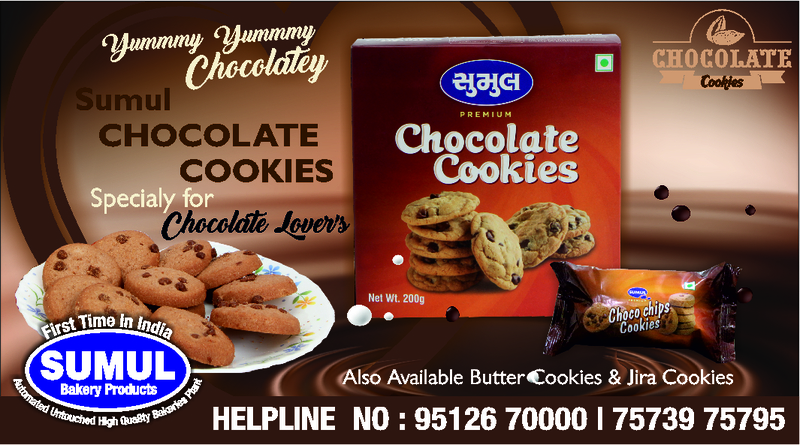 H R Suresh, Chairman, National Cooperative Bank (116), Mukesh Chandra Gajjar, Director, Surat People’s Cooperative Bank (114), Satyabrata Samanta, Director, Bally Cooperative Bank (112) and Shankar Lal Jat, CEO, Bijnor Urban Cooperative Bank (97). The vote share of Patil-Mehta Panel was: Apna Sahakari Bank Chairman Dattaram Chalke got 204 votes, Bhavana Rishi Urban Bank Chairman G. Rama Moorthy received 201 votes, Azad Urban Cooperative Bank, A.M.Hindasagri bagged 196, Bardoli Nagarik Sahakari Bank, Gautambhai Vyas got 195 votes, Nagpur Nagarik Sahakari Bank, Sanjay Bhende received 181 votes, Channa Basava Swamy Souharda Sahakari Bank, K.Kalappa bagged with 179 and Raniganj Cooperative Ban, Gopalchandra Acherjee received 175 votes. 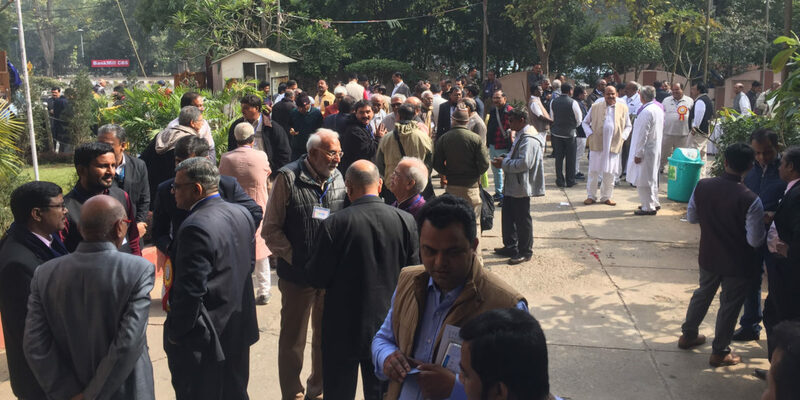 Delegates from across the country arrived at apex body of cooperatives National Cooperative Union of India headquarters at Delhi for participating in the election. Headquarters was packed with the veteran cooperators coming from across the country for cheering their candidates. Earlier, nine Directors were declared elected unopposed from the 21 state level federations. Similarly two Directors were elected unopposed in the credit co-ops constituencies. All of these have gone to the Patil-Mehta panel. N.V.Patel is the new government nominee replacing Ramesh Mantri from this position. The board term will be of five years. The election process has been completed smoothly under the supervision of Om Prakash, who was the Returning officer.